Depending on where you live, there may be a lot of rules and restrictions around dumpster diving, or there may be none at all. Regardless of what is legally required, there are a few guidelines we think everyone should follow. Here are six of the biggest no-nos when it comes to dumpster diving. It’s rule number one of dumpster diving etiquette. While you may be all about rescuing trash, it doesn’t mean you should trash someone else’s property. Beyond being rude, this can result in the dumpster owner posting signs, locking dumpsters or calling the cops. Not to mention the fact it gives dumpster diving a bad name. If you don’t want to be fined for vandalism, best to clean up after yourself. Besides, it’s the neighborly thing to do. Don’t put anything in a trash compactor that you aren’t willing to permanently lose. Not a hand, not a leg and especially not your whole body. Dumpster diving in a trash compactor is never worth this risk. Ever. Trash compactors can be extremely dangerous. There are already numerous cases where rummaging through a trash compactor ended in tragedy. Don’t be the next news headline. Stay out of trash compactors. A quick Google search can provide plenty of how-to advice on accessing a locked dumpster. While we appreciate the enthusiasm for liberating dumpster goodies, we’re putting our foot down on this one. Do not pick a lock, break a chain or open a locked dumpster by any means. Don’t break locks on dumpsters. The consequences can vary based on local laws, but it’s pretty safe to say it’s a bad idea. Breaking locks can result in serious trouble with the law, which leads us to our next dumpster diving no-no. While it may be tempting to ignore posted signs and get into that dumpster treasure trove, don’t. See that fence? Don’t climb it. While you may be tempted to go the extra mile to liberate that dumpster detainee, think twice. 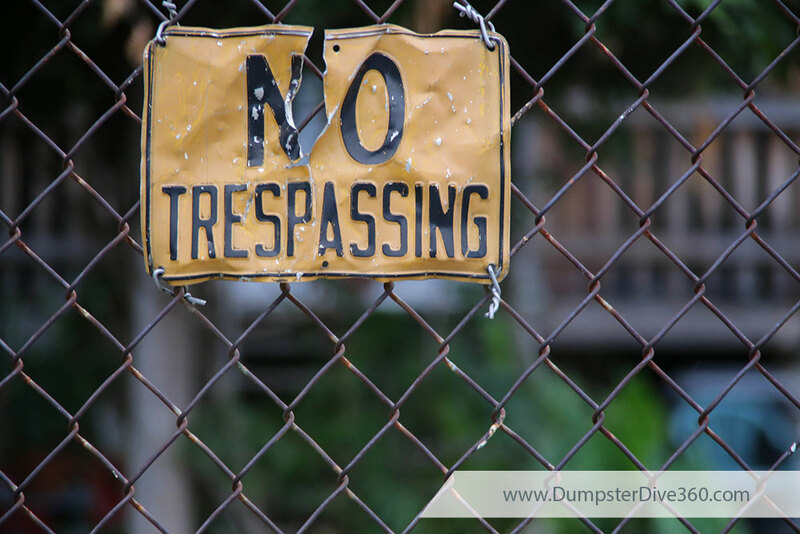 Ignoring trespassing signs and property boundaries can get you a hefty fine or worse. Even worse than a date with handcuffs is the potential dangers of trespassing. Beyond upsetting the property owner, you could be risking your safety. As much as people and companies post signed for privacy and to protect property, it is sometimes for the safety of the would-be intruder. This is especially true of construction and industrial sites. You never know what you are going to find when you go dumpster diving. This makes for an exciting treasure hunt, but it can also be a bit dangerous. When you are digging for great finds, remember to never stick your hand somewhere you can’t see. If you are one who likes to fully immerse yourself and dive in, be careful to not step somewhere you can’t see. An overflowing dumpster makes for great prospecting, but the more full the dumpster, the harder it is to see what might be lurking. We recommend carrying a long pole or stick, ideally with a grabber or hook at the end. This tool comes in handy when you need to poke around a bit to see a dumpsters contents. It is also a good idea to put on a thick pair of work gloves. This will help minimize the chance of cuts and scrapes as you dig around. Okay, this is more of a courtesy thing. Would you like to come home to find your driveway blocked by someone digging through your trash bin? Probably not. Remember to extend the same courtesy to others when you go digging through dumpsters. Before getting started, make note of any paths for vehicles and pedestrians. Be sure to check for doors to ensure you are not blocking exits or obstructing access to utilities or storage spaces. Beyond the basic human decency of this one, there is also the little issue of traffic violations. You will have to do a lot of dumpster diving to offset the cost of a ticket, especially if you are a repeat offender. Everyone has their own rules for dumpster diving. What is your favorite tip to stay safe and out of trouble when you go dumpster diving? Tell us your tips and check back at DumpsterDive360.com to share your dumpster finds. Remember to stay safe and always be considerate of others!